Hmmm, Educated is difficult to rate. It hovers between three and two hearts, but I have settled on three. This is the true story of Tara Westover, raised Mormon by her survivalist father and mother, never sent to school, forced to work dangerous jobs in her father’s scrap and junkyard business. It is the story of her survival under a mean but loving patriarch. I found her narrative at times riveting, especially once she leaves the family home and begins to pursue her education at BYU, and at times boring. Her writing is inconsistent. I think she is not a very good writer and includes too many details of her life. Then again, with six siblings living in their family home in Idaho, the stories, the catastrophes, the violence, and the relationships are numerous and complex. The abuse she endured was not like my recent reads, My Absolute Darling and The Great Alone. There is no sexual abuse. More, there is religious abuse. Educated portrays very well the Mormon doctrine of the power of men, and the servitude of women. I don’t think most of the Westover family ever sees the gross error of these doctrines. So, do I recommend it? Yes, I guess, but not wholeheartedly. I think you will just have to try it on for size! Interesting review. My other friends who just read it and have multiple advanced degrees between the two of them have said it’s one of the most compelling books they have ever read – and they insisted I read it and so gave me a copy. We’ll see! I already had this one on my list. Appreciate your review. Will get to it one of these years. This book was briefly considered by Deschutes Public Library’s committee that chooses the annual A Novel Idea community read. I’ll get back to that, and why it was rejected, in a moment. I rate this book at 4 stars, not for the quality of the writing (though I don’t have as much of an issue with the author’s talent as Andrea does), but for the issues that it raises, and the truths that it tells. First, the issues that Educated raises: In the process of detailing her harrowing childhood and adolescence, raised by a father who regularly crosses the borderline between weird and actual psychosis, and a mother who is literally brain damaged after a horrendous car crash, Tara Westover invites the reader to examine several areas of ongoing controversy. These include the value of public schools versus homeschooling, the consequences of choosing mysticism/fanatical religious belief versus a science-based approach to life, the extremely negative view of women that fringes of established religions (e.g. splinter Mormon groups, Islamic fundamentalists, some Christian fundamentalists, even some forms of the Jewish religion), and the debate about whether government regulation/intervention in our lives is net positive or net negative. It always helps, when considering controversial issues, to hear the voice of someone that has actually BEEN there, otherwise there is the risk of white people who speak out authoritatively on racism, having never experienced it themselves, or men who expound endlessly on women’s issues. And Tara Westover has most certainly BEEN there. 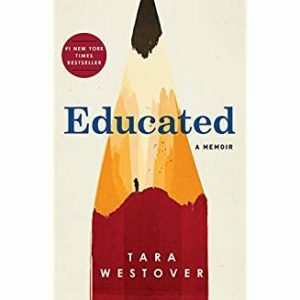 The truths that it tells…..Educated was largely booted from the A Novel Idea selection process because the group (9 women, 2 men) didn’t like Tara Westover’s voice. Westover’s progress from physically abused, educationally impoverished, culturally isolated child to a renowned PhD, educated and now teaching at some of the world’s most prestigious universities, is slow, and painful. Andrea noted that she was bored by the account at times. Some folks in the Novel Idea group felt that Tara was a bit whiny, or too indecisive, or pathologically unable to step away from a family that injured her time and time again. So here’s the truth that Educated reveals, a truth that should be galvanizing in terms of resources that we provide for children: The damage done by a life of extreme deprivation (both physical and intellectual) the effects of being raised in a cult of ignorance, denial, anti-intellectualism, and a complete detachment from any remnant of evidence based knowledge, is deep. Marianas Trench deep. And it takes a long, very long swim to the surface to get air. There are no magical turnarounds in lives such as Tara’s. Even astounding determination and stellar intellectual capacity cannot erase all the scar tissue that she accumulated in her upbringing. The brains of children raised like Tara was are physically altered, we now know. The most popular memoirs about difficult upbringings (e.g. Angela’s Ashes, the more recent Glass Castle) are good at talking about what happened to the authors, but are much less successful, and in a sense, less honest, about the permanent scars and very real disabilities that such upbringings leave on a child. Lastly, the title of the book, Educated, was a carefully chosen one. Tara’s route to her partial salvation was….education. Specifically, the availability of an education (free in the public schools, scholarships at Brigham Young and Ivy League institutions) that provided her with the opportunity to navigate her way toward mental health and a fulfilling life. The book is a clarion call to make education (free or easily affordable) available to all. In Westover’s case, it was the key that opened the door that allowed her to escape the incarceration imposed upon her by her upbringing. There is no pursuit of happiness without access to education. Time, Tara Westover says, to deal with this. My friend and colleague Dan Murphy is such a breath of fresh air! I hope you enjoy his postings as much as i do. Dan, thank you for taking the time to share your perspective. It is also SO wonderful that Dan is on the committee to select our local public library’s community read each year. This makes him not only very well read, but also able to analyze much better than I what he likes and doesn’t like about a book. I particularly resonated with what you write about Westover’s voice. Reading your comment rang true … it was her voice, perhaps, more than her writing skill, that distanced me from the book and my enjoyment. After reading The Great Alone, My Obsolete Darling and Educated, i couldn’t take another book about abuse. I checked The Glass Castle out of the library and then took it back unread. Maybe later.